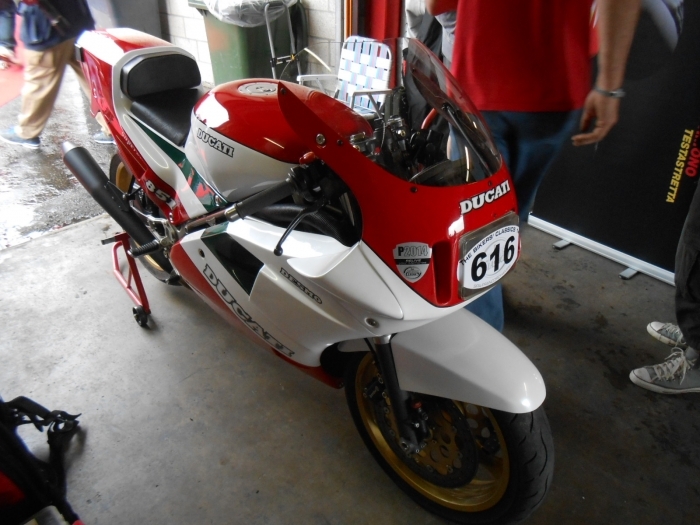 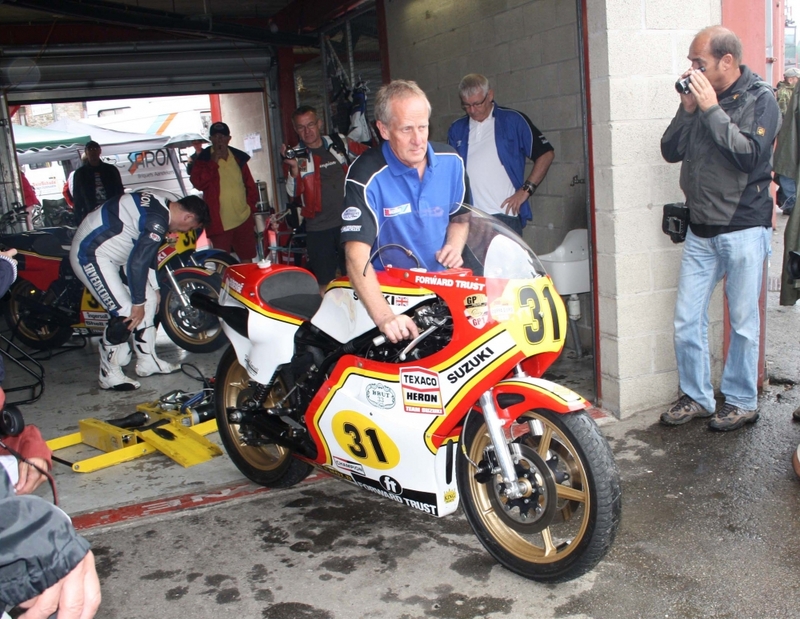 which has been brought to Spa by its well known owner; racer and journalist Alan Cathcart, who explained the history of the bike which was the first 'customer' bike to leave the factory. Alistair Wager of Brititaliamoto is returning the bike to it's original condition for Alan and was very pleased to gain some of the experience we at THE CRANKCASE have learned about these wonderful bikes. 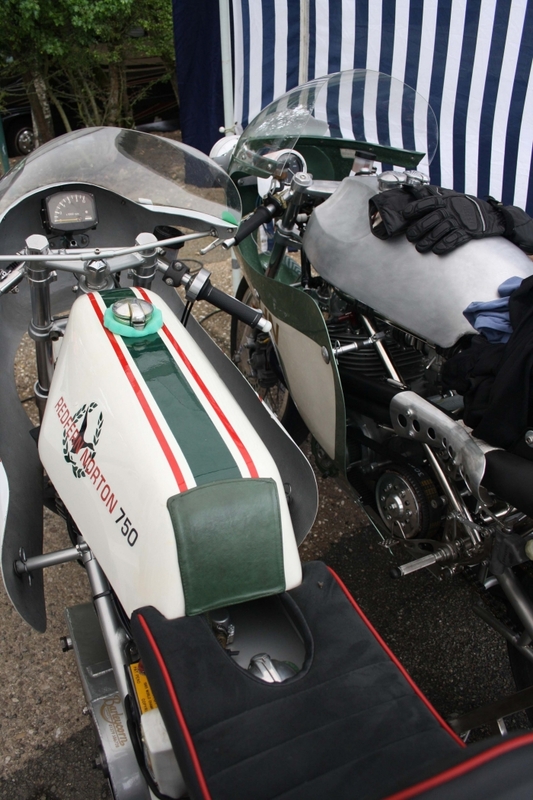 CLICK to see Alistairs website including his road going Supermono. 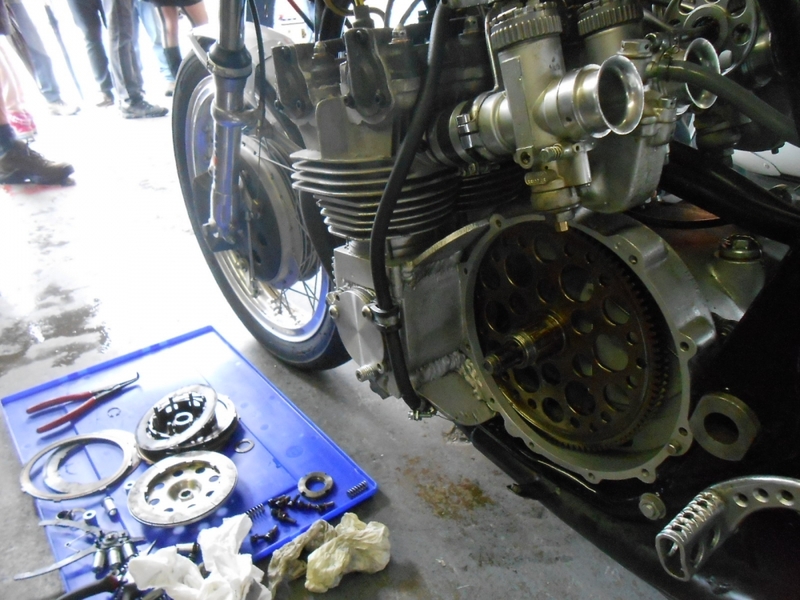 In a nearby pit, a chance to see the clutch being replaced on this very rare GP Benelli. 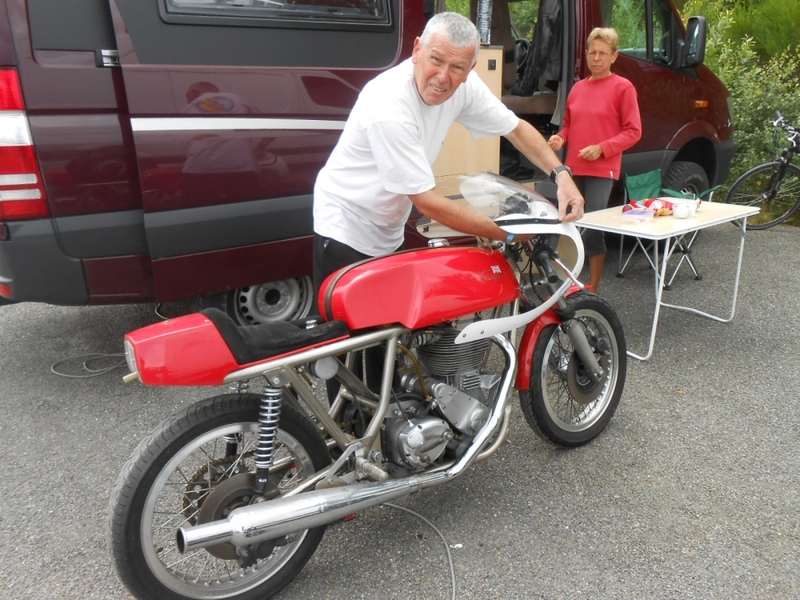 The work being watched over by Robert Lannucci, the owner of the famous Team Obsolete, which had also brought a 1970 MV Agusta triple for the event. 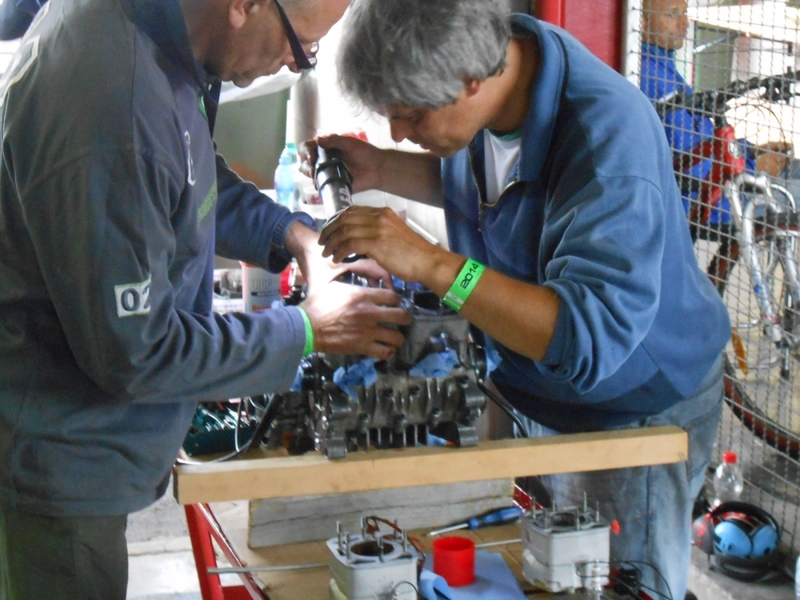 The ex Franco Uncini Team Gallina Suzuki TGA1 recieves a last minute engine rebuild in the pits. 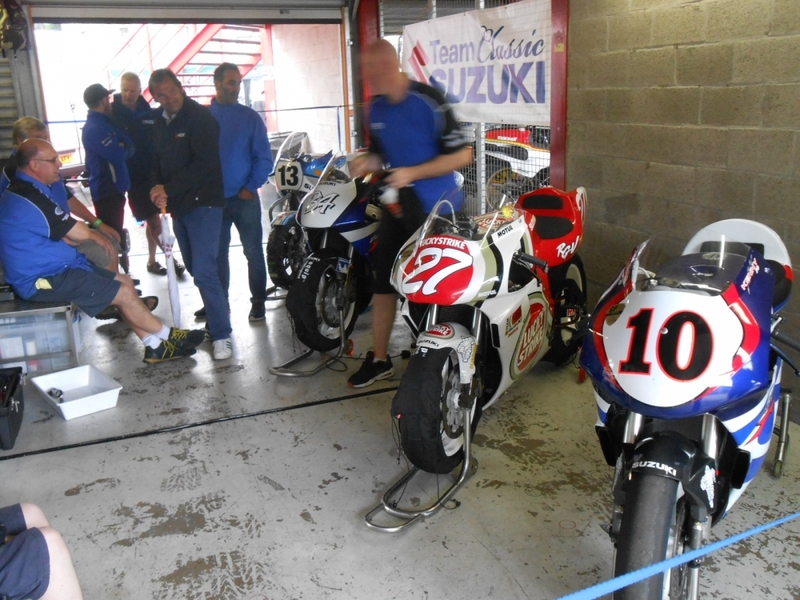 Team Heron Suzuki waiting for action in the pits. 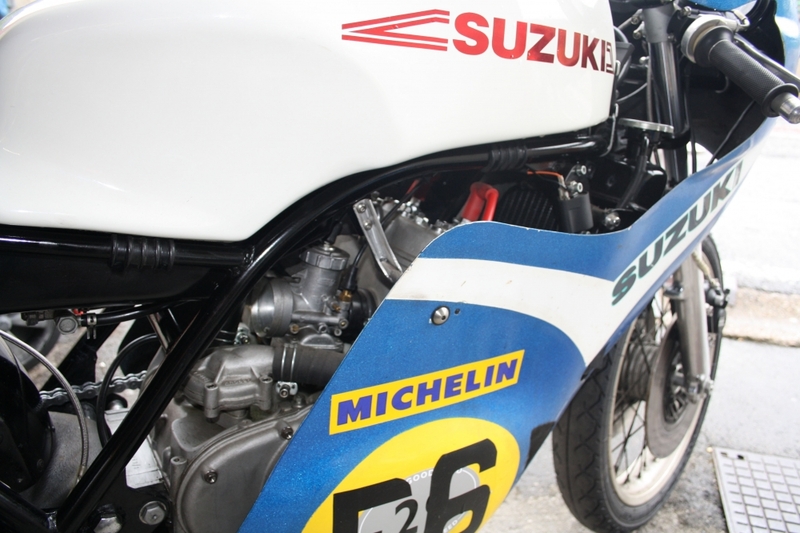 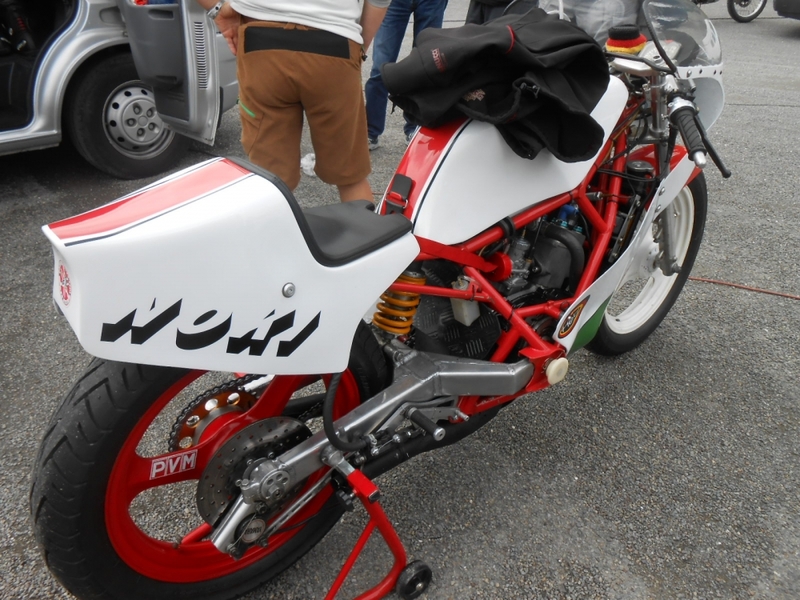 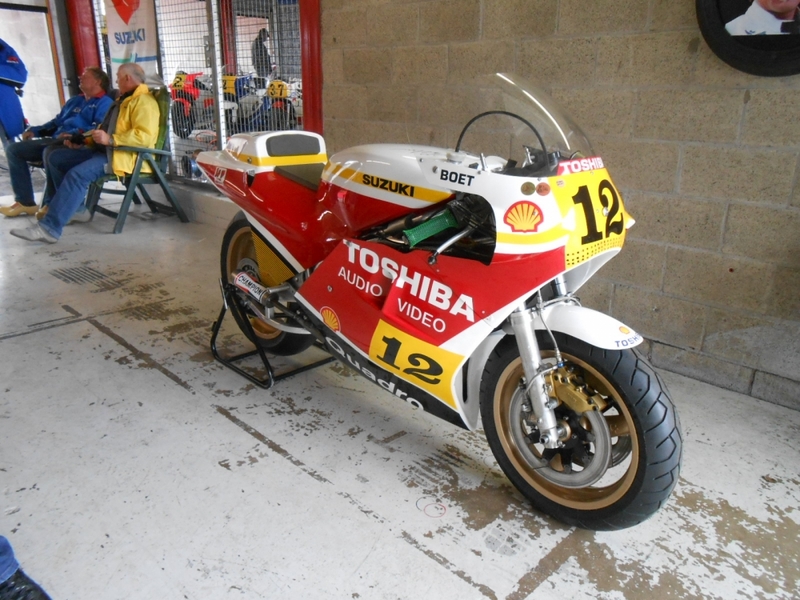 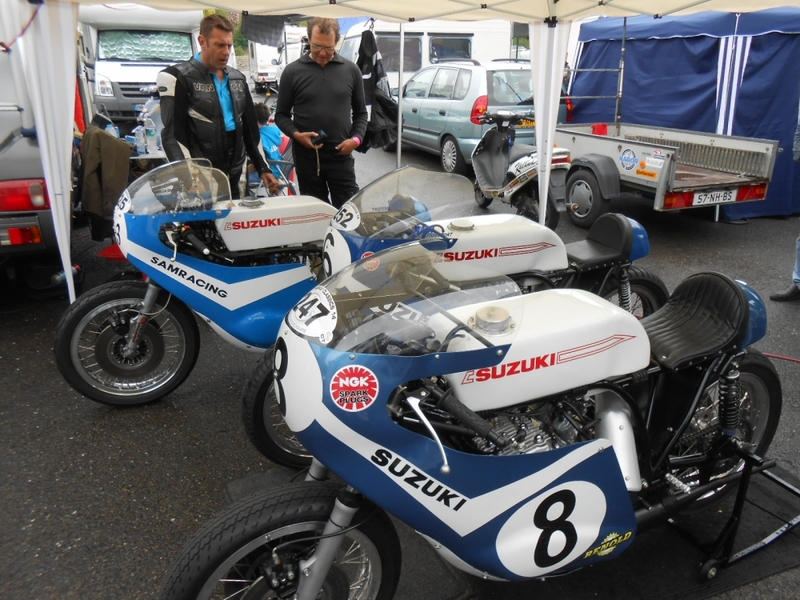 2014 was the 40th birthday of the RG500, celebrated at Spa with a gathering of over 22 machines and its derivatives. 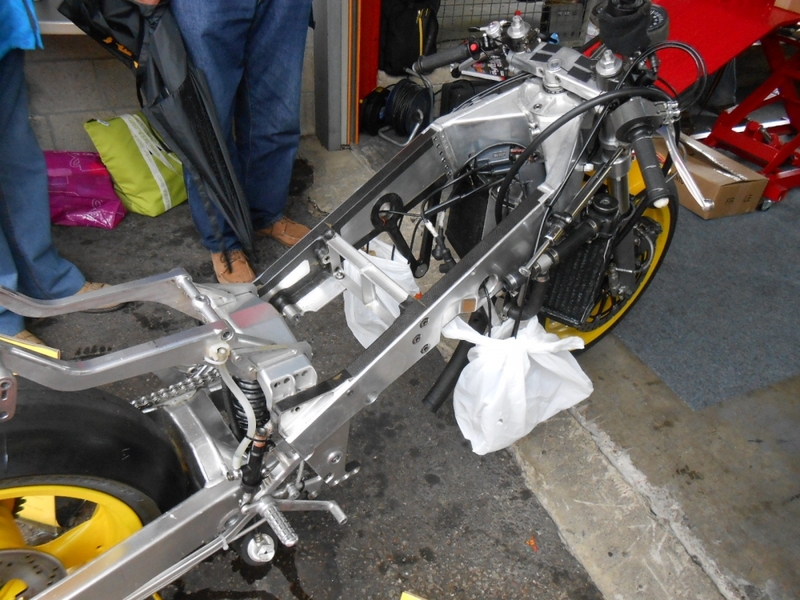 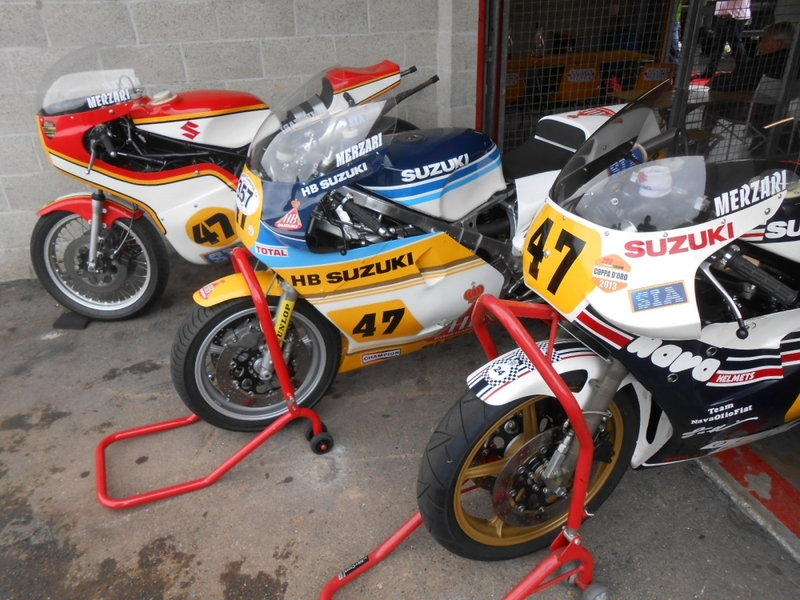 3 bikes brought to the event by Francesco Merzari. 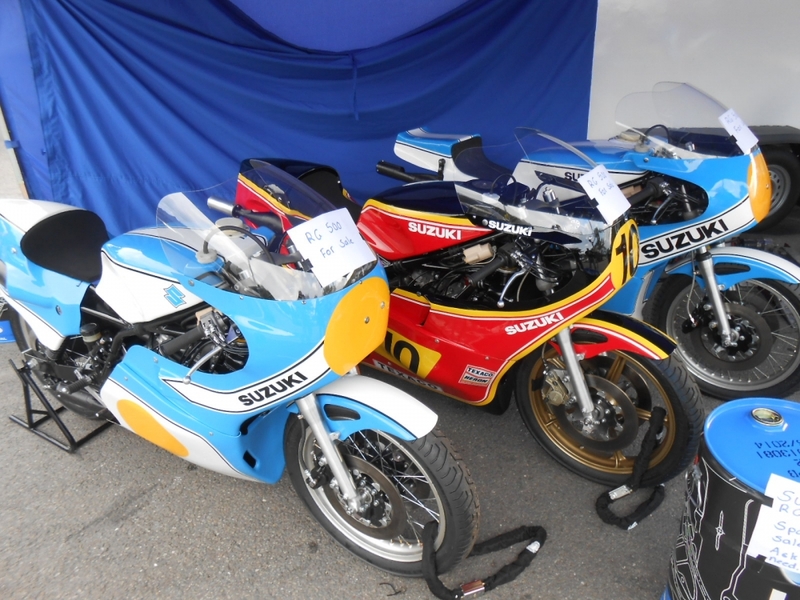 A massive trun out by the Team Classic Suzuki with riders: Freddie Sheene, Mick Grant, Philippe Coulon, Will Hartog and Steve Parrish doing the hard work. 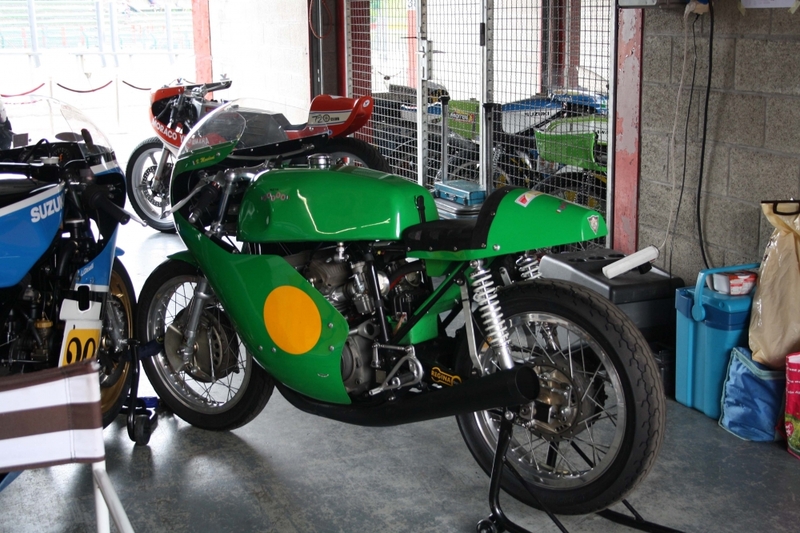 One of several original and replica Paton GP bikes to be seen at the weekend. 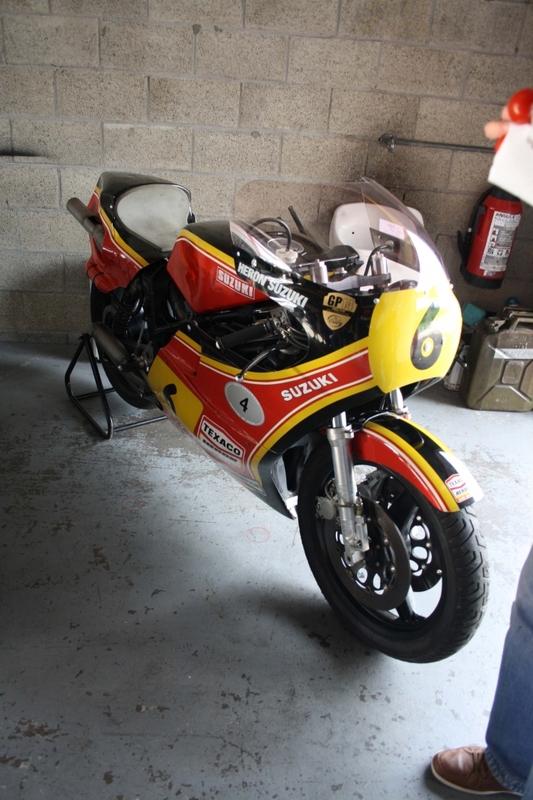 A fascinating 1973 König 500/4 Grand Prix bike. 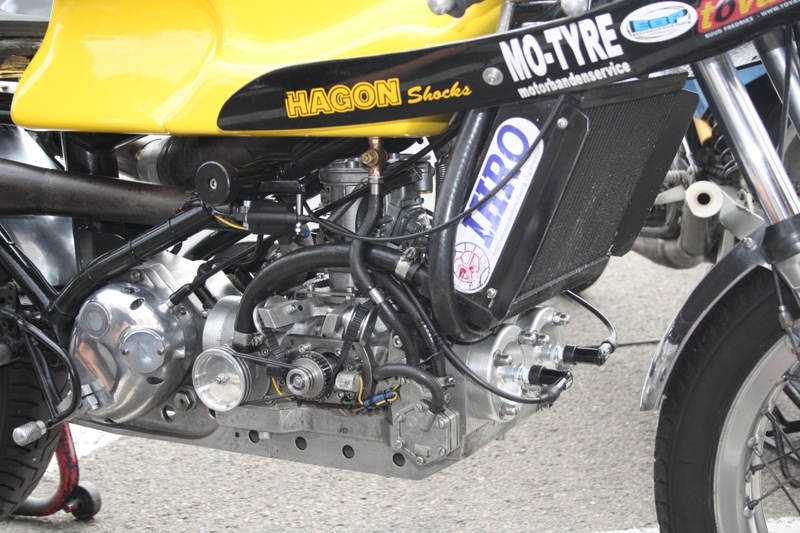 Foward and back 4 cylinder boxer with disc valve for the central carbs driven by an impossibly delicate toothed belt. 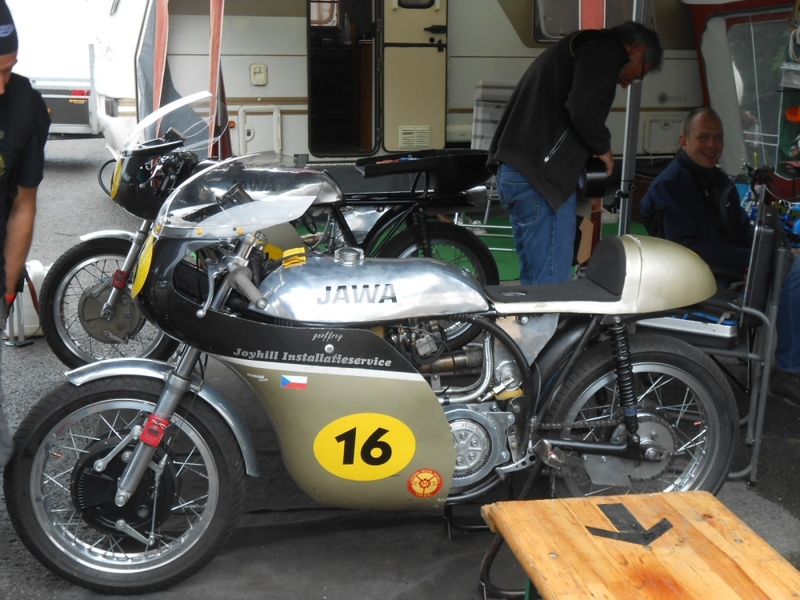 A fascinating piece of German Grand Prix history. 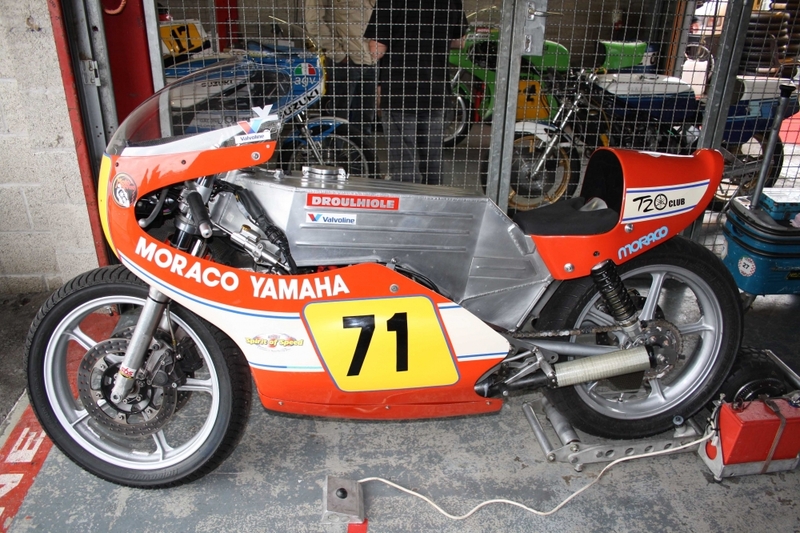 1975 352cc Moraco monocoque framed Yamaha from the Amicale Spirit of Speed team. 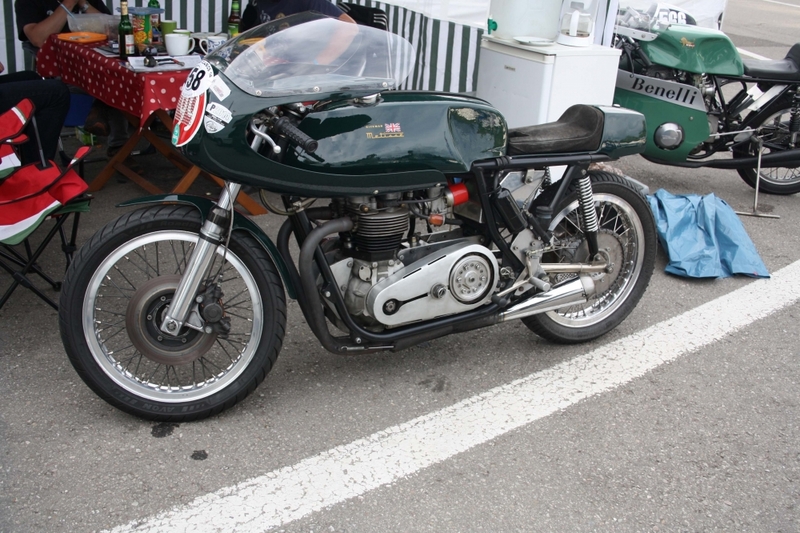 One of several Seeleys to be seen at the weekend too, this one with a Matchless 500 engine. 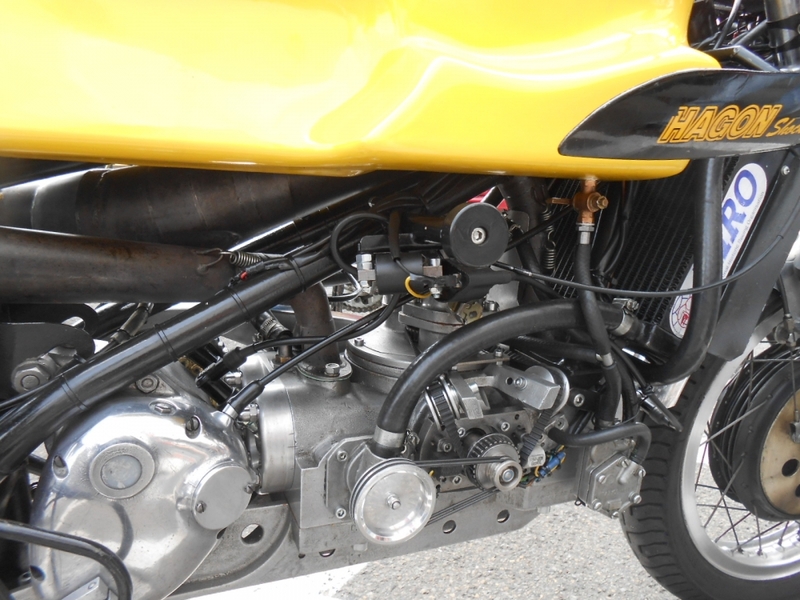 BSA Gold Star engine here with beautiful workmanship to be seen especially on the frame which like many Seeleys has been left unpianted. 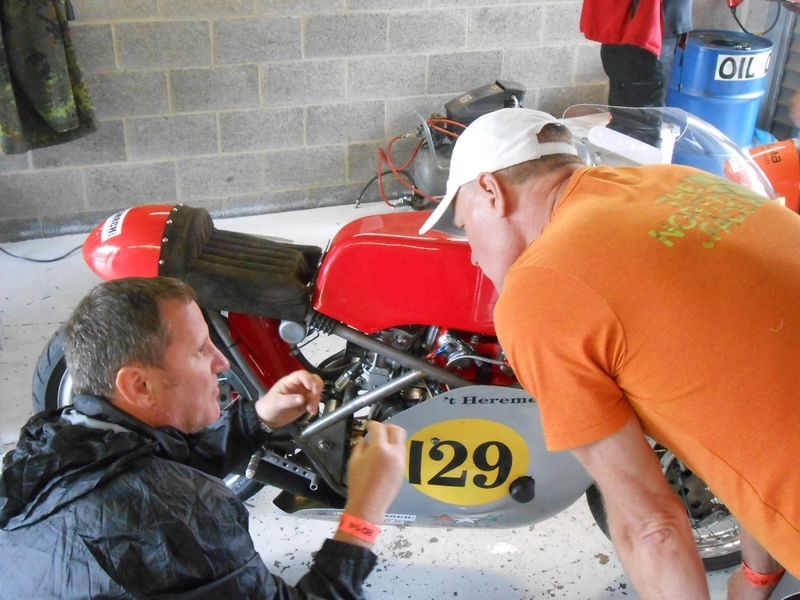 A rare Drixton Honda 500 being analysed in the pit before the riding sessions start. 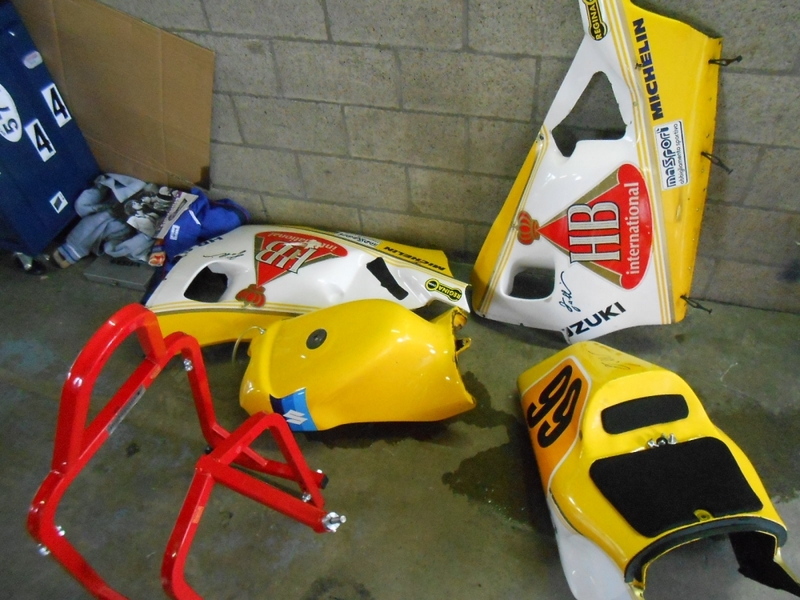 More RG500s, these however in the paddock and all for sale ! 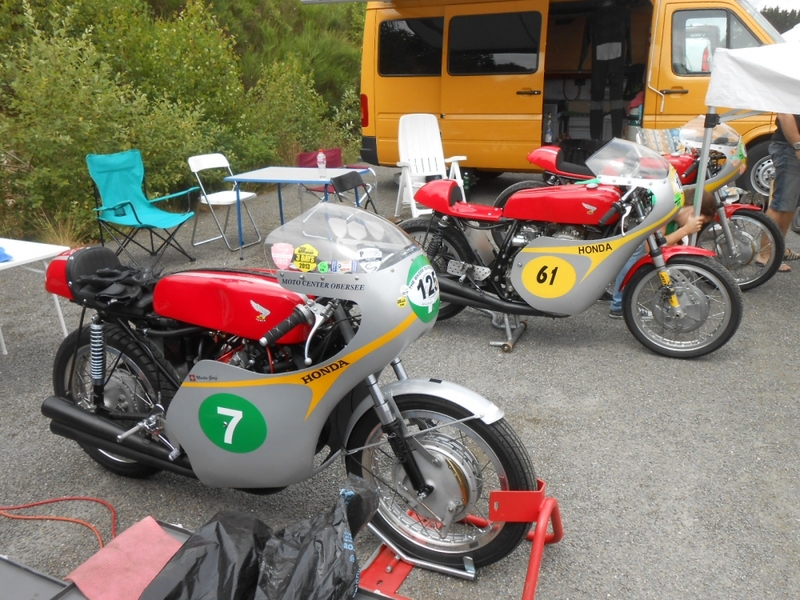 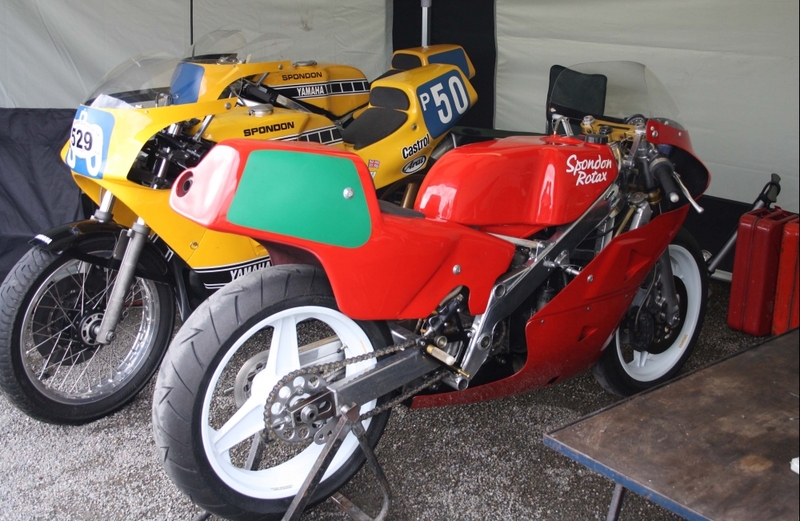 Honda 'RC163' with 2 stablemates in the paddock. 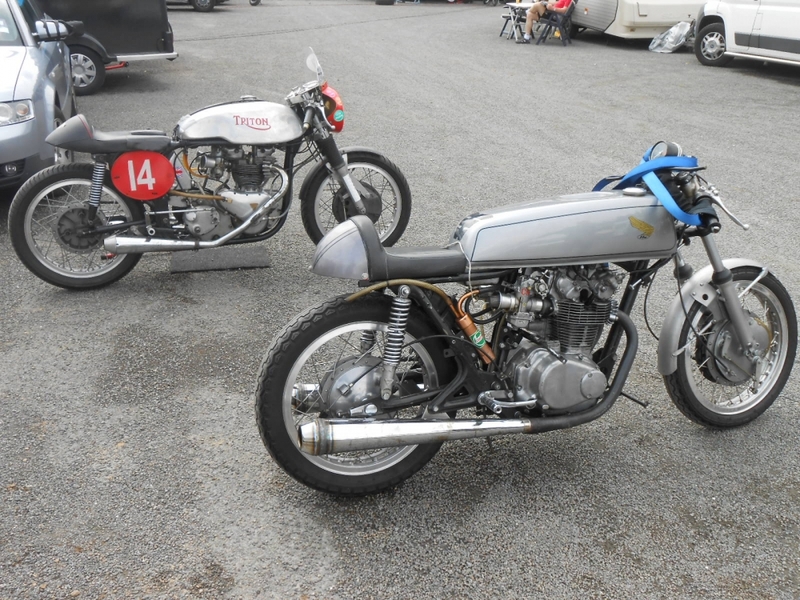 Triton and Honda CB450 both making excellent club racers. 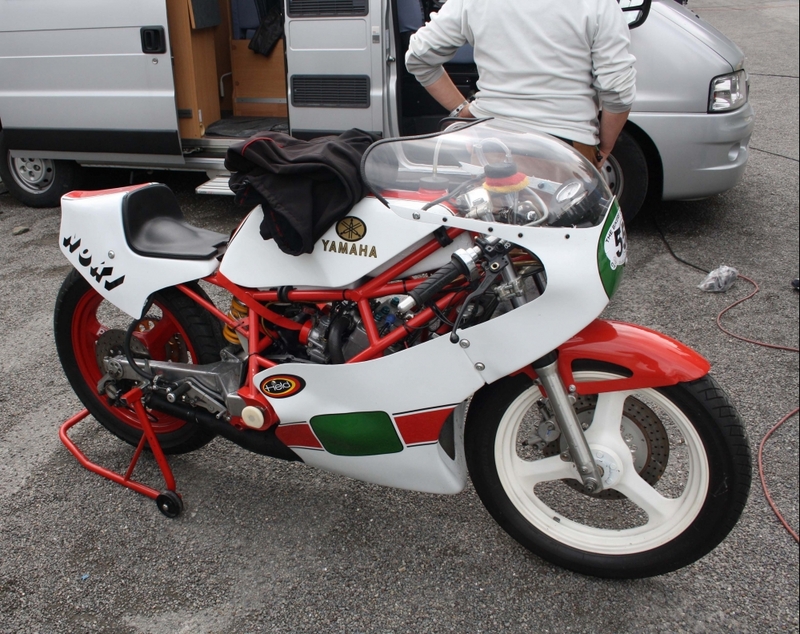 Noki Yamaha 250 of Manfred Nestroy with a concentric swing arm pivot similar to early Bimotas. 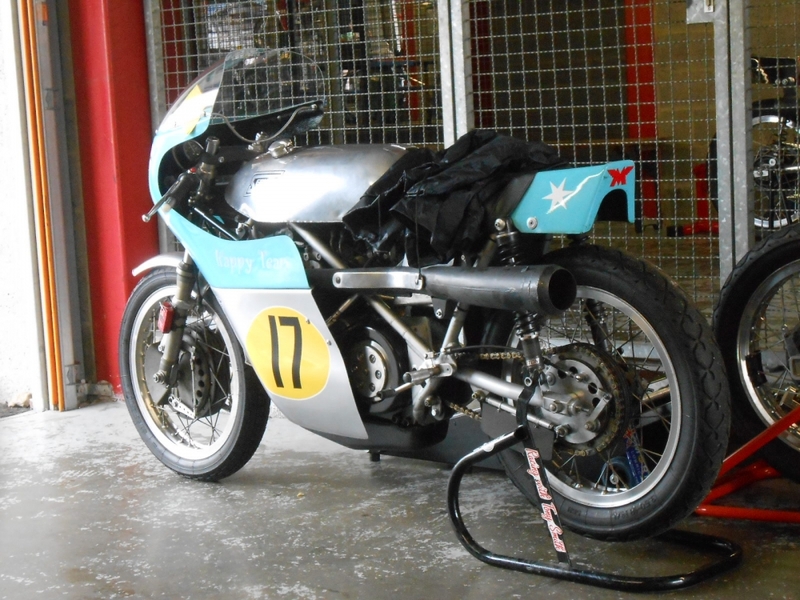 Fascinating AMF Harley Davidson GP bike. 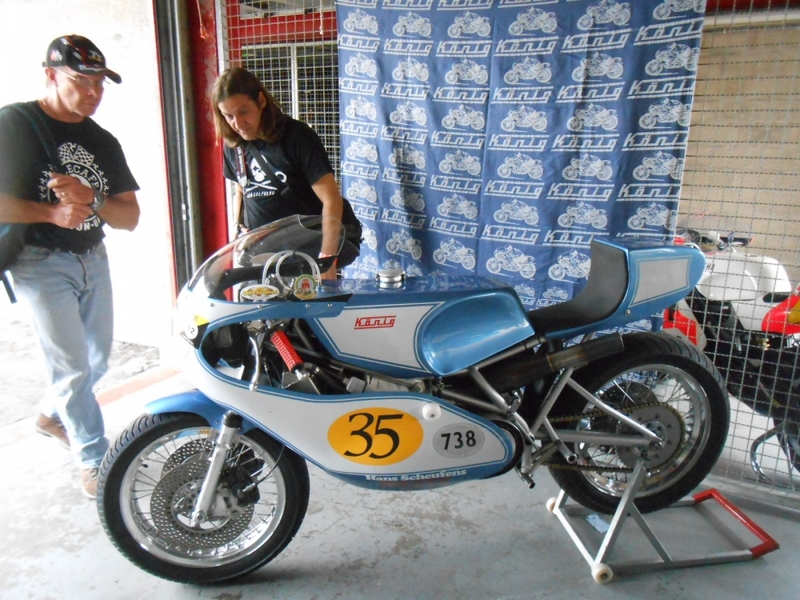 Spondon Rotax 250 single of Andrew Godber. 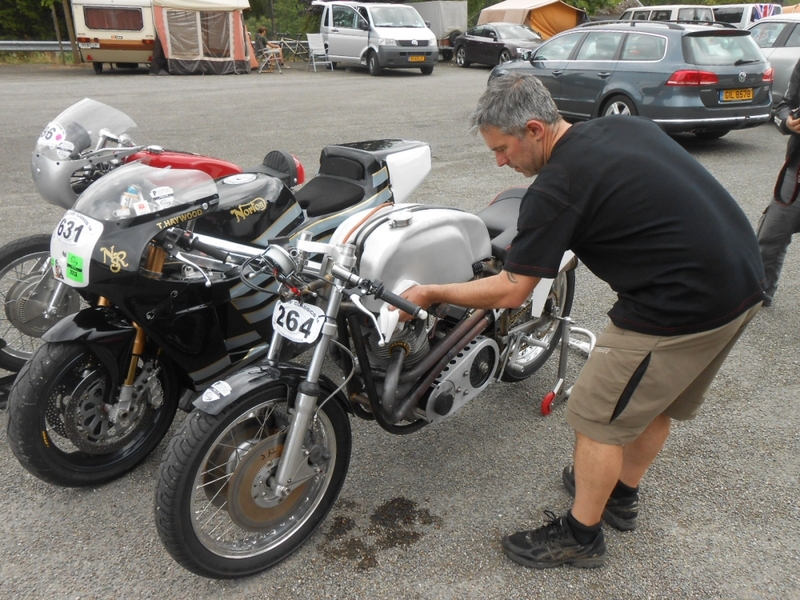 Elegant Rickman Metisse with BSA Gold Star engine getting the final preparations. 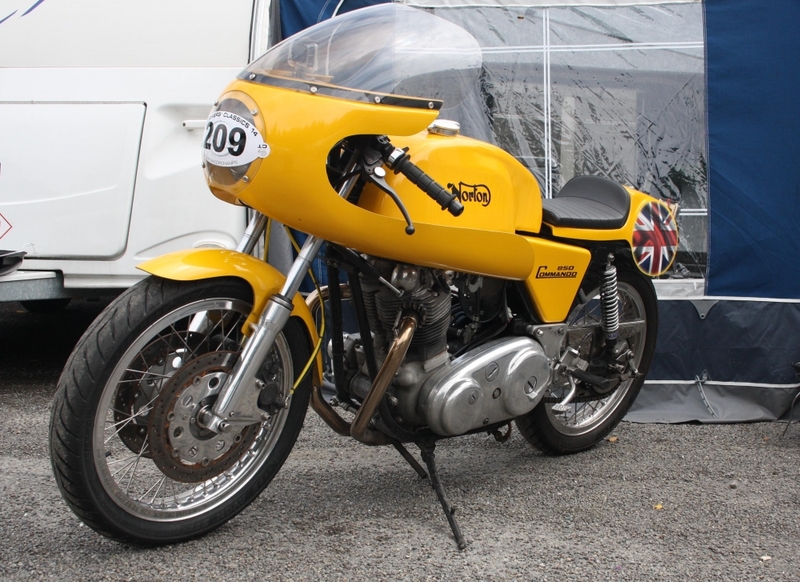 Another Rickman with an 8 valve Triumph engine. 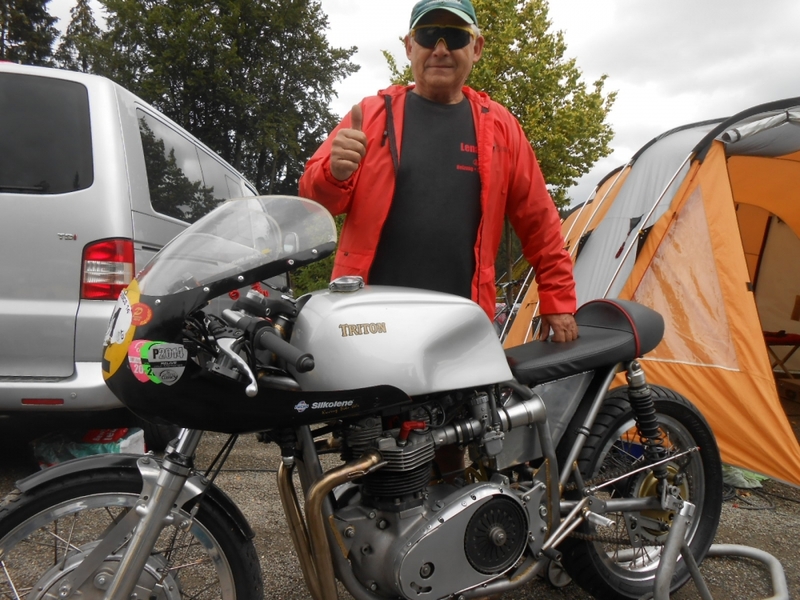 Frank Weibgen with his 1964 750 Triton. 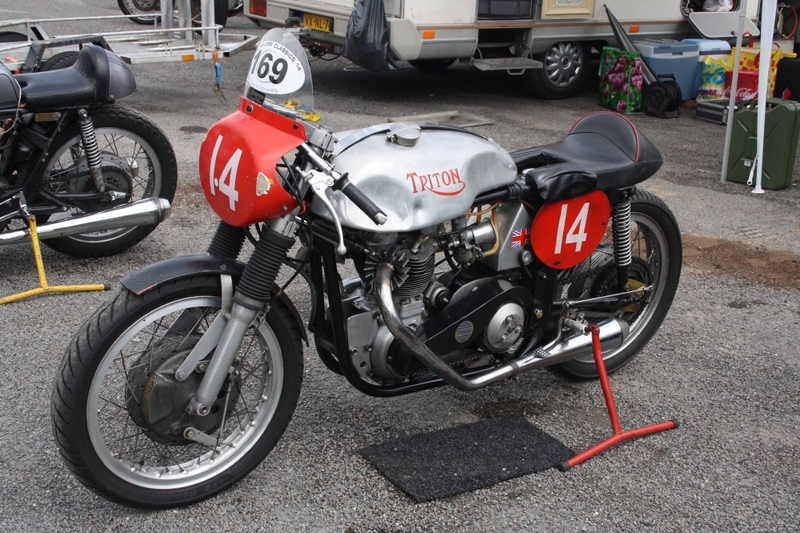 Robert Smits' 1953 Triton T100. 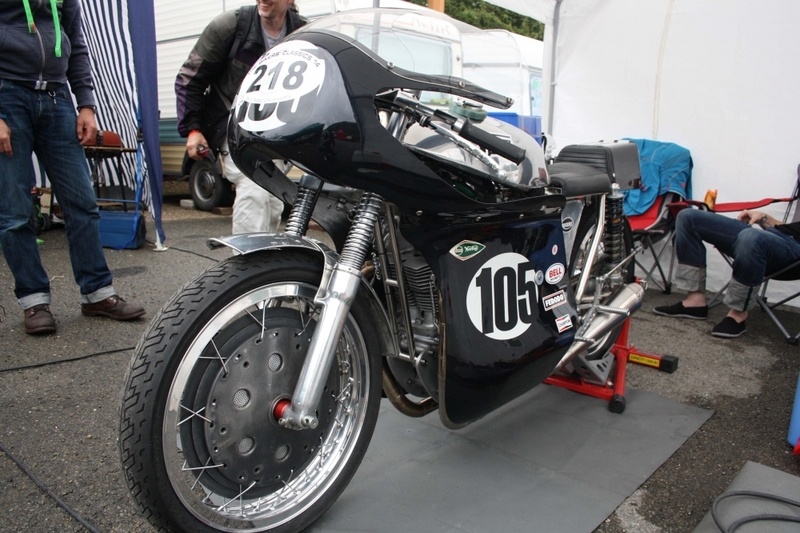 Fantastic 750cc Seeley Commando belonging to Cord Ehlers. 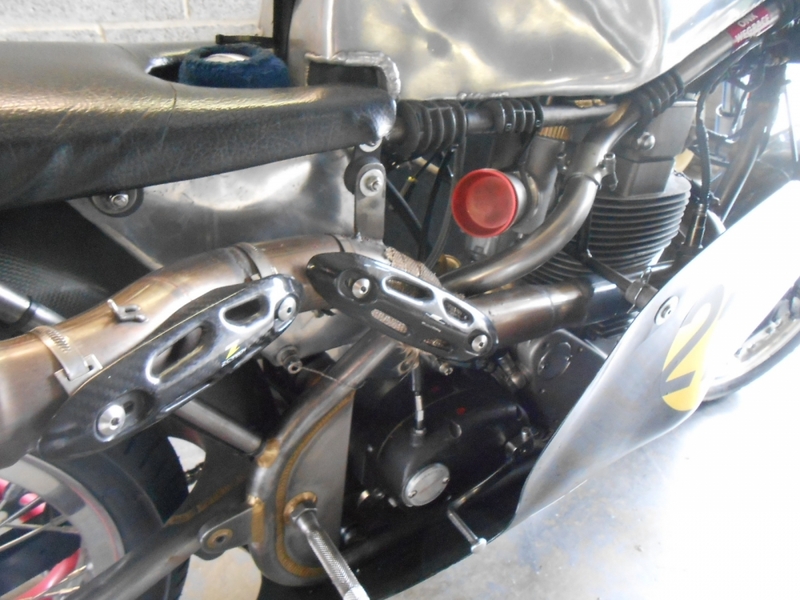 Norton wideline chassis, this time with a single cylinder Jawa engine. 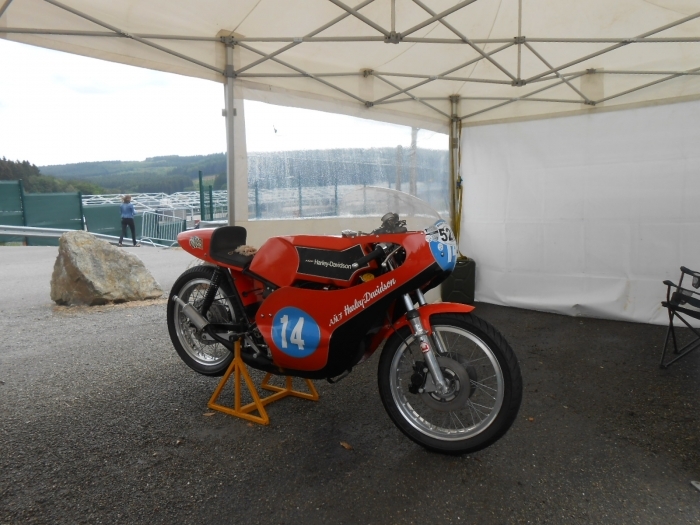 Another wideline with Commando engine, behind one of several rotary Nortons at Spa this year. 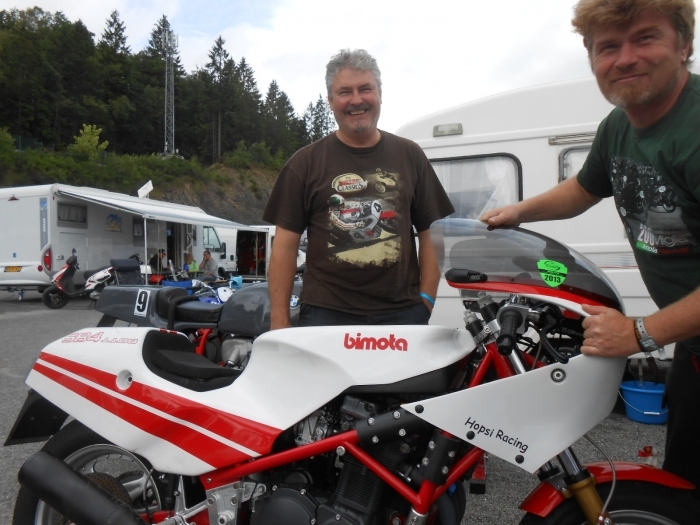 A cool couple of guys with their Bimota SB4 which they have brought to have some fun on the track with. 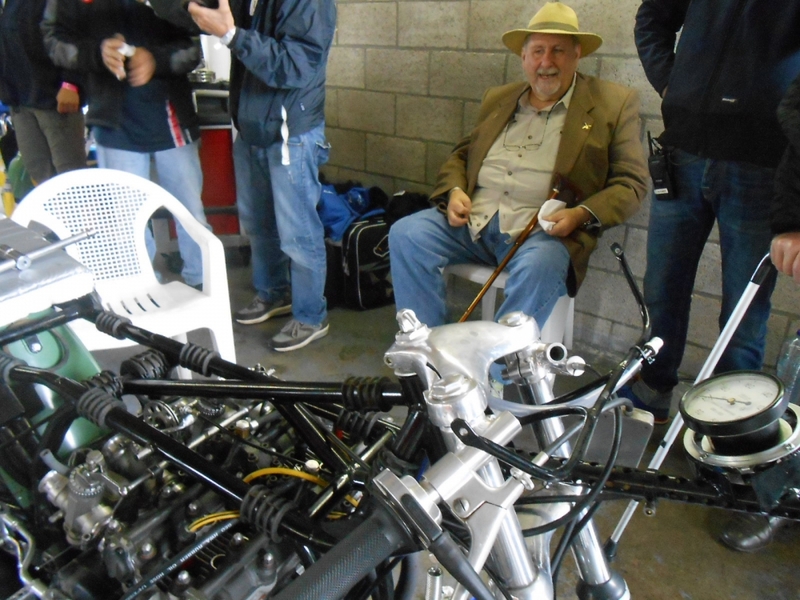 Thanks for the coffee guys. 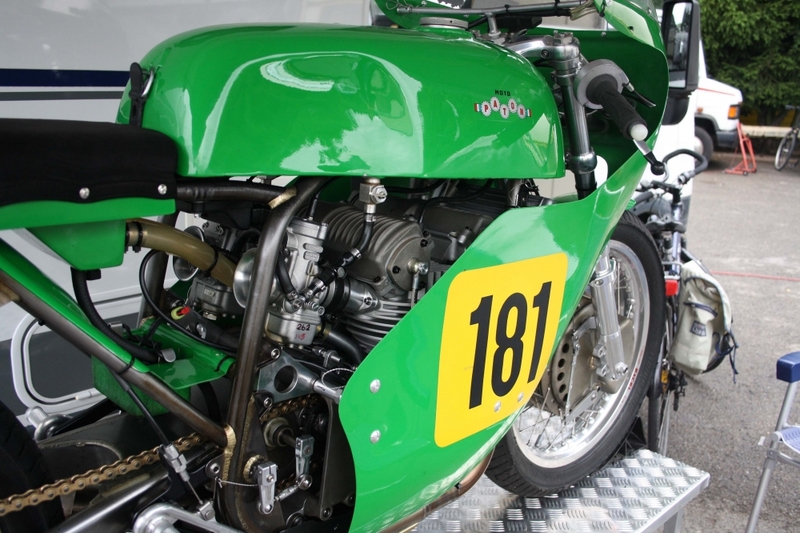 CLICK to go to the next page to see some of the track action.